Today we will see how to set up custom URL for our blogger.com site. Note: First you have to purchase your domain from any Domain Registrar site. When you purchase a domain from GoDaddy.com, they assign an IP address (A record and CNAME record) for the domain. Hence, you need to change those records to point to your Blogger.com blog. This post will help you to change the A and CNAME records of your GoDaddy.com account. 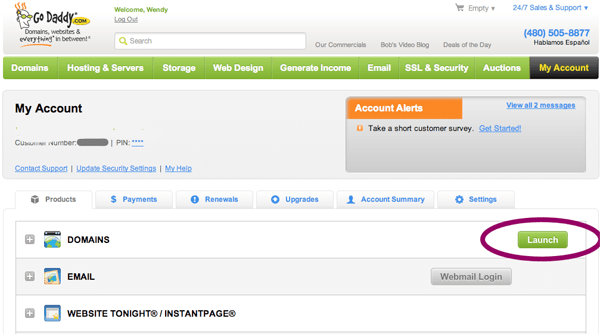 Step 1: Login to your Godaddy account and click on the My Account tab on right corner. 2.Under Domains, you will see the list of your domain names. Click on Advance Details of your desired domain in case you have more than one domain. You’ll be directed to the Domain Manager page. Under the A(Host) Tab of the DNS manager, enter the 4 IP addresses as shown below, one-by-one, using the Quick add button, to change the A records. a.Click on the Quick Add button in the box labeled CNAME(alias). If you have already created a CNAME record for your blog’s address, click the pencil icon next to the existing CNAME record. b.After you are done adding records, click on Save Changes to save your edited data. c. For the Name, enter only the sub-domain of the address you want to use for your blog. For example, if you picked www.myexampleblog.com as your address, enter www here. d. Enter ghs.google.com as the Host Name. Specify a TTL or use the default setting of 1 hour. This is how you can change the existing domain IP address that now points to your Blogger IP address. Wait for few hours for the changes to take effect in your IP records. After that you can say good bye to your old Blogger.com blog URL by changing it with your desired custom domain name. Hope guys this will help you…. Happy blogging. « How to change your blog template and make your blog attractive and SEO friendly….